Alumacraft Boat Co. with facilities in St. Peter, Minnesota and Arkadelphia, Arkansas offers a staggering selection of over one hundred models of aluminum boats for 2015, categorized as Deep V, Mod V, Riveted Jon, Sierras, Utility, and even aluminum canoes. Some are all-welded. Some are riveted. Sizes range from ten feet to almost twenty-one feet. There are dual console, side console, and tiller models. 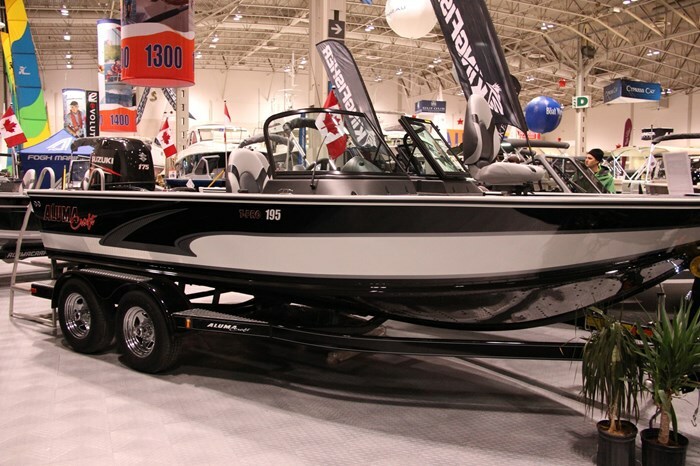 The Tournament Pro (referred to as T-Pro) 195 Sport, subject of this review, is one of thirteen Sport models from sixteen to almost twenty-one feet in the Deep V series which itself has a total of thirty-one models, the others being side console and tiller models. All of the Sport models are dual console. There are only two T-Pro Sport models; the 185 and the 195. All of Alumacraft’s Deep V models are constructed with what it describes as, “Our exclusive 2XB™ full-length, twin-plated hull (which) offers twice the strength and protection from the bow to the transom.” The T-Pro 195 Sport is a big deep boat with an overall length of nineteen feet, three inches, beam of eight feet, one inch, transom width of a full eight feet, a maximum hull depth of 43 inches, and a maximum interior depth of 22 inches. 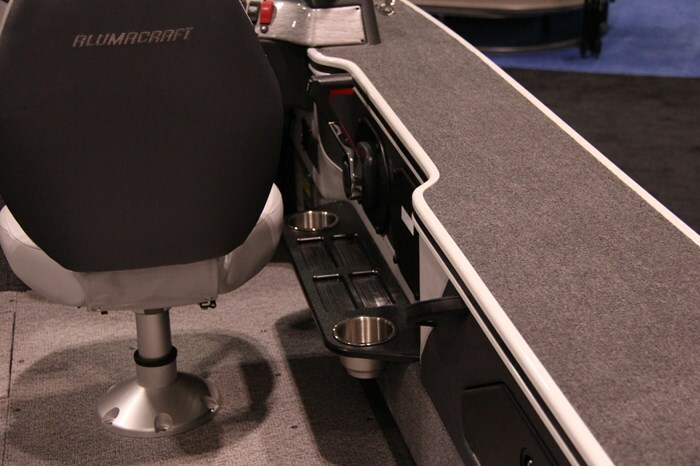 Alumacraft certainly had tournament fishing in mind when it designed and outfitted this boat. It is loaded with all the right standard equipment and offers lots more optional equipment to personalize it for the type of water activities and type of fishing you intend to pursue. 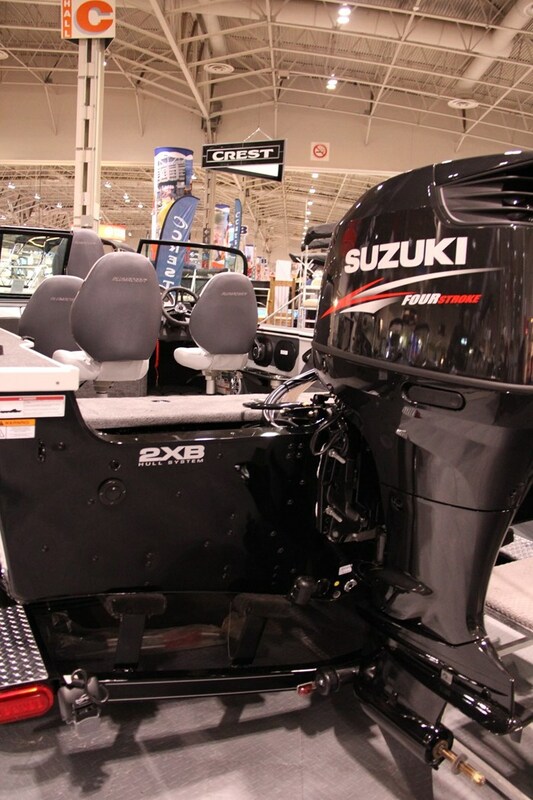 First of all, to get you out to your favourite fishing hole quickly, the T-Pro 195 is rated for a maximum 200 horsepower with hydraulic steering standard, and since Alumacraft is “An independently owned and operated boat company,” its boats are available with your choice of brand of outboard motor from Honda, Yamaha, Evinrude, Suzuki, or Mercury. Three removable high-back folding fishing chairs, including a slider on the driver’s chair, are provided with the T-Pro 195 along with six floor bases in which to mount them – four in the cockpit and one each centred in the bow and stern casting decks. The tall, three-piece windshield with centre walk-thru has rounded corners leading to the integrated side wings offering protection from the weather plus great sightlines. A tilt steering wheel is standard, ahead of which is an unusual dash layout where a pod on the left side of centre houses the standard instrumentation consisting of speedometer, tachometer, voltmeter, and fuel gauge. To the right of centre is a large flat surface suitable for surface mounting your choice of virtually any size of GPS/fishfinder. The front surface below this flat area houses all of the DC rocker switches. The passenger dash houses a lockable glove box and again, a large flat top with molded-in lips across the front to hold in any items you may wish to “store” up there temporarily like glasses, wallets, change, caps, lures, etc. Open dry storage is found on the floor beneath both driver’s and passenger’s helms. A lockable top-loading gunnel storage compartment on the cockpit port side has dedicated storage for five rods up to nine feet long. 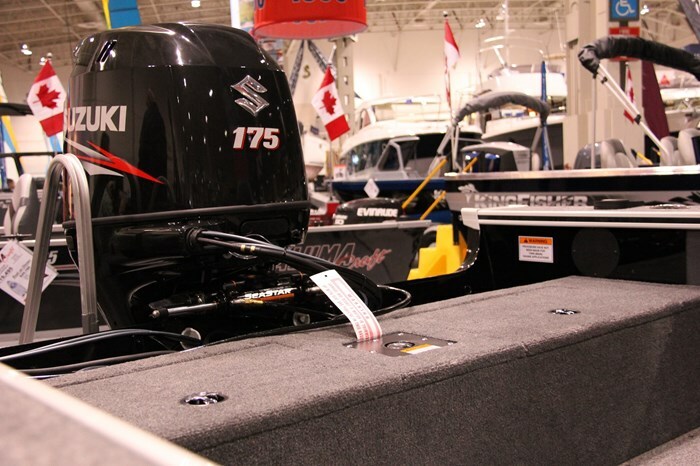 Additional lockable rod storage is found between the two consoles and extends under the bow casting deck. It has dedicated storage capabilities for eight rods; four up to seven feet, six inches long and four up to eight feet long. If you’re counting, that’s dedicated, lockable storage in total for up to thirteen rods! One very large starboard side and one smaller port side storage compartments are found within the bow casting deck plus a much smaller open storage area beneath the bow trolling motor mounting deck. Bow cargo nets along the sides are also standard. 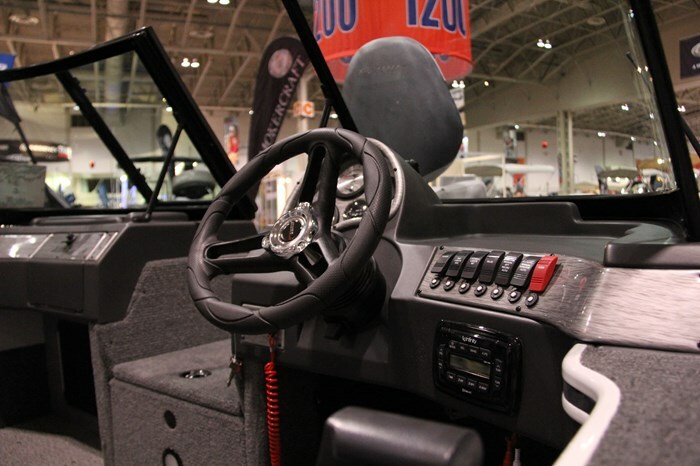 The T-Pro 195 comes standard with not one but two aerated and timed livewells with lights, one within the bow casting deck and one within the stern casting deck. Both are eighteen gallon capacity. Also within the stern deck is a dedicated battery storage compartment and a second trolling motor battery compartment is found beneath the centre bow lockable rod storage compartment. Other notable standard equipment on the T-Pro 195 includes an AM/FM stereo, 36-volt trolling motor system, 12-volt power point, folding cleats, full interior carpeting, plus Alumacraft’s integrated Alumatrac™ system for gunnel mounting of accessories such as rod-holders, tools, etc. You also get your choice of six hull colour schemes. 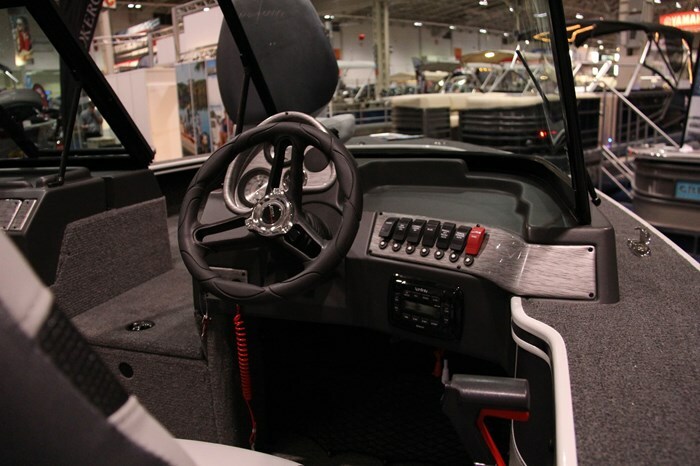 Notable optional equipment includes a Minn Kota trolling motor, Lowrance or Humminbird GPS/fishfinder, upgraded stereo, vinyl flooring with or without snap-in carpet, sport steering wheel, various canvas coverings, Alumatrac™ accessories, plus your choice of Shoreland’r, Eagle, or EZ Loader trailer. 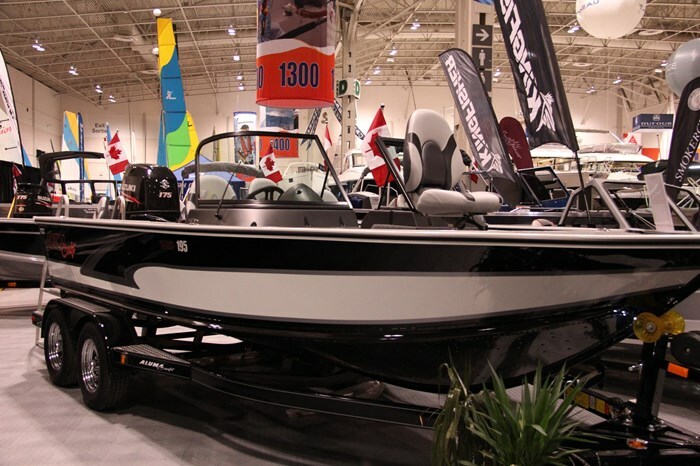 The Alumacraft Tournament Pro 195 Sport is a dedicated fishing machine through and through.